Welcome to the epic tale of a selfish brat — vridniX is a 'hero' who can't stop running! He bounces against walls, hangs from the ceiling with his massive tongue, he can do backflips in mid-air and above all... he has the unique ability to rotate levels by picking up special orbs! Unfortunately, by using his ability, vridniX will eventually destroy all the places he passes through. 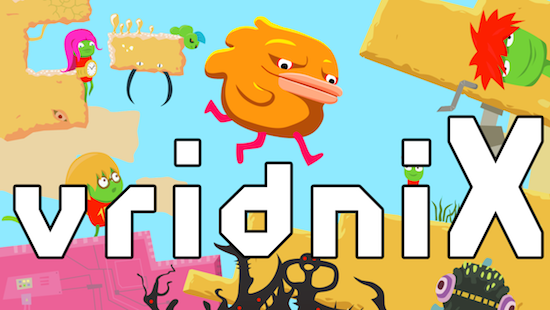 Play as the evil hero — and ragequit in over 100 frantic levels because vridniX is a true challenge. An elaborate plan by publisher Deck13 and developer Uncanaut to announce a new game today has been all but sidetracked! Hard at work, they were hit by some weird three legged creature calling himself vridniX and claiming to be a hero! What sorcery is this!? Instead of the originally planned announcement, we now follow the advice of the strange orange creature to report that vridniX, a speedy and chaotic 2D platformer will hit Steam on August 16th! Bringing a generous helping of salt and madness to Steam (He also forced us to mention something about a Neta-Vark? Some sort of place where the Wamnis live? ), vridniX will challenge all comers. Fight epic bosses, but you can't attack!